Marty Boe is a proud father of two, who was born and raised in Sioux Falls, South Dakota. He has been drawing since before he can remember. Starting with copying cartoon characters and 80s skateboard graphics as a kid to designing T shirts and posters for his band and friend’s bands later on. This lead Marty to doing work for touring bands like The Black Keys, the Melvins, the Dwarves, Dog Fashion Disco, the Bronx, and Hank Williams III, just to name a few. 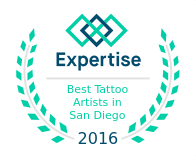 Marty completed his apprenticeship under Wade Sanchez (Who also works at SD Tattoo), and has been tattooing professionally since 2014, joining SD Tattoo in . He really enjoys completing tattoos with bold lines and bright colors. 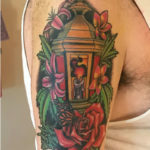 Styles include neotraditional, traditional, floral and illustrative tattoos, but is always pushing his boundaries and learning new techniques. 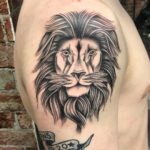 To schedule a consultation or tattoo appointment with Marty, please call the shop or use the website contact form and our scheduling manager will get you set up with an appointment.